Director of Engineering George Hennessee and Engineer Anthony Mensah recently gave a presentation for citizens highlighting the plans and progress of the 52nd Street Construction Project during an update meeting hosted by Ward 3 Councilman Caleb Davis. While there are no major traffic restrictions at this time, the prior month’s work in terms of progress and performance include the following. · Road widening from G Avenue to the railroad halfway tracks adjacent to Grandview Softball Fields has been complete. · Approximately 142 feet of storm sewer has been installed. · Progress with water line work continues as approximately 1200 linear feet of DIP and PVC pipe has been installed near the south end of the project; approximately 786 feet of HDPE pipe has been completed near Wolf Creek. 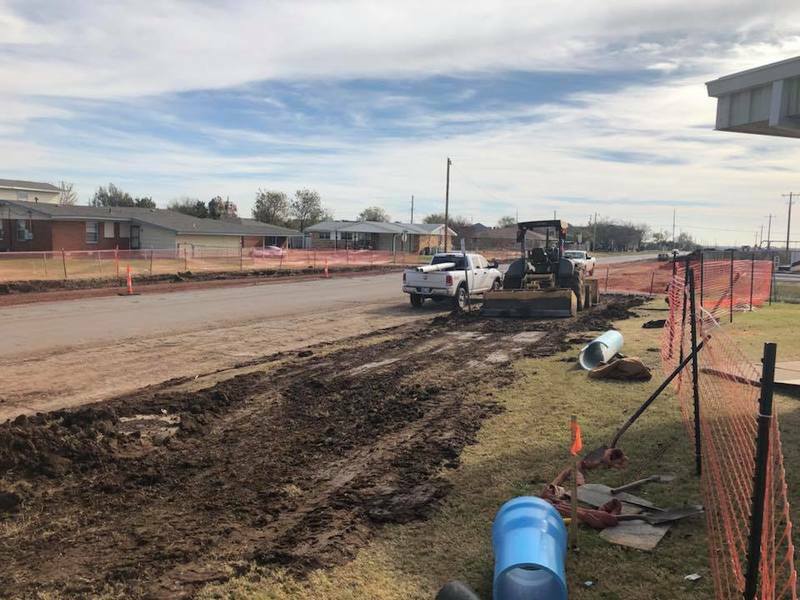 · Fire hydrants and tees are being installed. · One sanitary sewer line and two manholes have been completed. · 155 feet of curb and gutter has been installed in the Eisenhower High School parking lot. · An ADA-accessible sidewalk has been installed on the north side of the Stripes convenient store at 52nd and Gore. · A retaining wall placement near the playground of Eisenhower Elementary School. · Additional storm sewer installment. · Continuation of a 12” main line installation toward the south end of the project. · Continuation of the removal and patching of road islands. · Completion of temporary paving at Eisenhower Elementary School. The 480-day, 6.1 million dollar project began in September. Work is being carried out by T&G Construction of Lawton. As of November 17, 2017, approximately 5 percent of the overall project work has been completed. The City of Lawton is working closely with Lawton Public Schools, neighboring citizens and local business owners to minimize disruption by keeping parties aware and informed. We thank you for your patience and support of this project.